Gary Horton believes that Dallas reserve quarterback Drew Henson raised his stock more than any other player allocated to NFL Europe this offseason. Henson is a household name we have all heard about and at first glance he is a higher profile guy than we are used to seeing in NFLE. However, Henson is a player who still needs game experience and live snaps. Henson’s biggest problem in his young NFL career has been his inability to read defenses, process information, and make quick decisions â€¦ and that’s what you do in these game situations. He has all the physical skills that you are looking for and he is coming off a season for Rhein in which he completed 109 of 209 passes for 1,321 yards and 10 touchdowns, but most importantly, he threw only three interceptions. The latter statistic leads you to believe that his decision making has improved. So, where does Henson fit in the Cowboys’ plans? 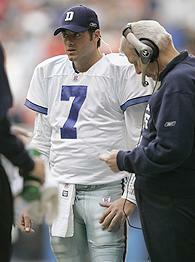 He will compete again with Tony Romo to be backup quarterback behind aging starter Drew Bledsoe. However, with Bledsoe near the end of his career, the Cowboys must decide whether Romo or Henson is their quarterback of the future and Henson’s positive performance in NFLE should raise his confidence level entering training camp. According to the article’s footer, Gary Horton, a pro scout for Scouts Inc., has been a football talent evaluator for more than 30 years. He spent 10 years in the NFL and 10 years at the college level before launching a private scouting firm called “The War Room.” This is high praise, indeed, coming from someone with that much experience. and could have challenged for the starting job. young qb back and diminished his confidence. out of Dallas and far away from Bill Parcells.